The gaming world may be collectively holding its breath for what is to come, but that isn't stopping the train of deals from coming online for the current generation of GPUs. Prices have been falling for a couple of months now, and new promotions may tempt you to finally pull the trigger on the upgrade you've been waiting for. This week NVIDIA are highlighting a new set of bundles available from participating retailers in the UK, EU and Nordic regions. 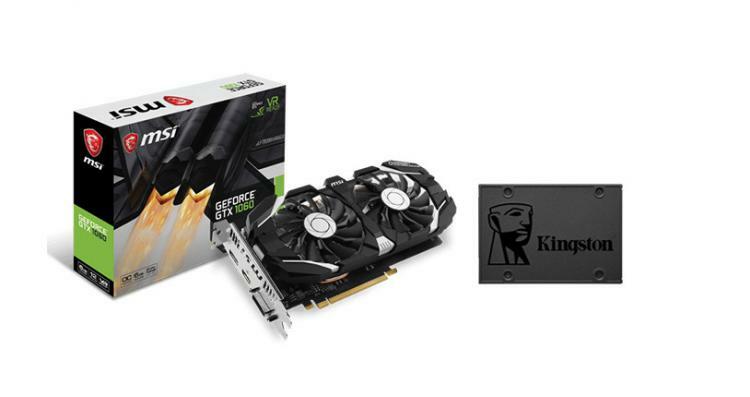 They have teamed up with Kingston to offer a free 2.5" SSD with selected GTX 10-series GPUs, adding yet more value to what might already be a pretty keen price. 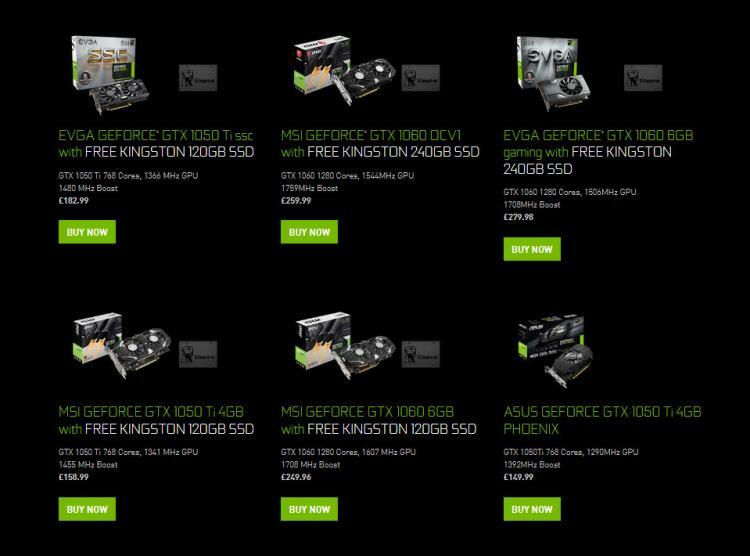 Visible under their Made To Game microsite - which highlights many limited time pricing deals for their GPUs - both GTX 1060's and 1050's from MSI and EVGA are available as part of the bundle. Two GeForce GTX 1050Ti models (priced from £158.99) come with a free 120GB 2.5" SATA III SSD, while three different GTX 1060 6GB models (priced from £249.99) are bundled with a 240GB SSD. An SSD, be it standard 2.5" SATA or lightning-quick M.2 NVMe, is one of the best upgrades you can make to a system if one isn't already present. Utilised as the Boot/OS drive, it considerably speeds up the general fluidity of the system; as a storage drive for games it accelerates load times and other aspects of performance. The in-play experience of certainly RPGs and MMOs in particular, including Destiny 2 and World of Warcraft, can benefit tremendously from being installed onto an SSD. Given the choice between an SSD and a free game, we'd pick the SSD every time. It's still not clear when the next generation of GPUs from either side of the aisle will be released. If you're in need of an upgrade or assembling a new system, especially if you're not delving into the higher echelons of performance, now might be a good time to start looking.